Waaaay back in 1984 I was first dipping my toe in the mighty pond that is the comics biz as assistant editor on Scream!, the tragically short-lived ‘creepy’ comic published by IPC Magazines. Among the amazing strips Scream! showcased was The Thirteenth Floor, written by John Wagner and Alan Grant (under the pen name Ian Holland) and drawn by Spanish artist Jose Ortiz. Featuring Max the computer, an A.I. 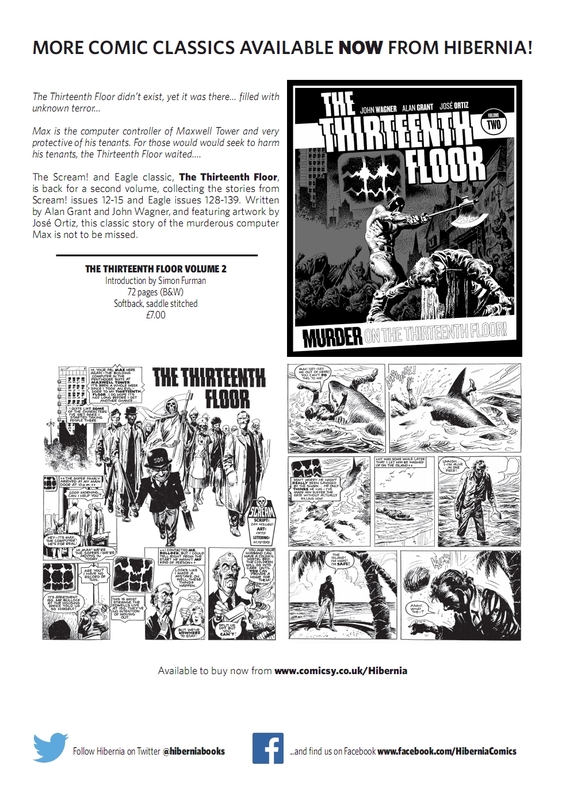 that creates a virtual 13th floor in the Tower Block it oversees in order to punish wrongdoers, The Thirteenth Floor ran in all 15 issues of Scream! and then transferred to Eagle, another title published by IPC at the time. Well now, Scream! has stirred from its resting place, in the shape of a second collection of the The Thirteenth Floor from Hibernia Press. This quality collected edition is a true labour of love, and — other than the great and now hugely rare strips collected within — features an all-new introduction by yours truly. All Hibernia titles can be ordered through their online shop here. I urge you to check it out. This entry was posted on Monday, July 21st, 2014 at 7:40 am and is filed under Uncategorized. You can follow any responses to this entry through the RSS 2.0 feed. You can leave a response, or trackback from your own site. 2 Responses to SCREAM… AND SCREAM AGAIN! Fantastic! I loved Scream back in the day. Such a shame it didn’t last longer than 15 issues or so. Is it true it was cancelled because there were complaints about it being too scary or violent for kids? Kinda. But not exactly. It’s all in the intro I did the new 13th Floor collected edition.